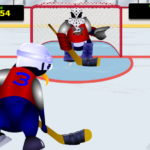 Play Ice Hockey with Captain Cage and score some shootouts and hit as many moving targets as possible to complete the game. 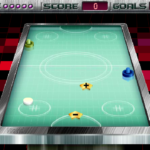 There are 20 moving targets you need to hit with your hockey puck. You can choose from 3 difficulty modes: Practice is the slowest and easiest one but great for starting the game. Normal mode is a bit faster but you should be able to hit mosts targets. 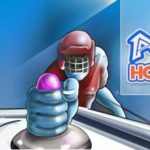 The last mode Difficult which is very fast and you need great hand-eye coordination or simple luck if you want to hit some targets. You can check the percentage of successful shots at the end of each round. To score as many shootouts as possible you need to aim your shots very precise and with the right timing. Do not let Captain Cage down and show him you are a great hockey player.